The Carthaginian general, Hannibal, is one of history’s most celebrated figures who is best known for having crossed the Alps with an army of men and a team of elephants. In 219 BC he attacked the Roman town of Saguntum (north of modern-day Valencia) which provoked Rome into entering the Second Punic War. Following this siege his forces spent the winter in the seaport of Carthago Nova (New Carthage) whilst they prepared for their arduous journey north. Now known as Cartagena, this port has continued to serve a key strategic role for various civilizations and remains an important Spanish naval base. It is also a popular cruise ship destination which sees some 150,000 passengers per year dropping in to spend a few hours in a historic port of call previously inhabited by Phoenician, Roman, Byzantine and Moorish peoples. 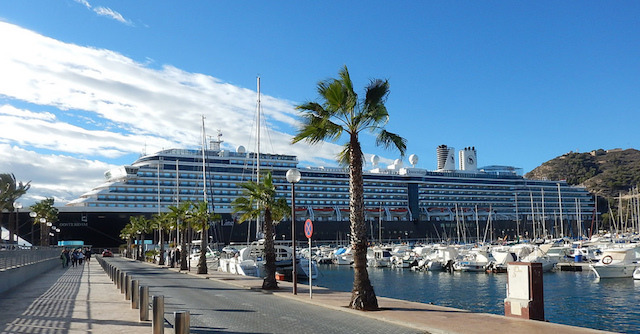 Located on the coast of Murcia in south-east Spain, the naturally deep Port of Cartagena can accommodate most vessels at the Muelle de Cruceros which lies on the northern side of the commercial port within a short walk of the city centre. Its location is ideal for cruise ship passengers who can walk into the city centre within 10-minutes. There’s a yacht club (Real Club de Regatas de Cartagena) right next to where you arrive which welcomes cruise ship passengers. Occasionally ships dock at the Muelle de la Curra on the south side of the port which isn’t quite so convenient as it requires a shuttle transfer into the city. Search All Shore Excursions Available from the Port of Cartagena. Walking: From the pier where you disembark simply walk north towards the town then turn left on Paseo Alfonso XII as you depart from the port area. On the opposite side of the road from the port you will soon come to the bus stop for the hop-on, hop-off bus service, turn right just after this bus stop and follow Plaza Héroes de Cavite as far as Plaza del Ayuntamiento which lies within the pedestrianised historic centre. There’s a tourist information office inside the Town Hall building where you can pick up a city map listing the main attractions. With moderate fitness you can walk around most of the city and there’s a lift to take you up to the castle on Concepción Hill to avoid any exertion. Tourist Bus: (Paseo Alfonso XII, 8) There are often mixed feelings amongst cruise ship passengers as to whether or not it’s worth taking hop-on, hop-off tourist bus services in cruise destinations. In Cartagena this Bus Turístico navigates a 45-minute circuit around the city but is not allowed to access the main street (Calle Mayor) or the compact historic centre which is for pedestrians only. For this reason and due to to the excessive time spent queuing for buses when a cruise ship is in port it’s hard to recommend the service unless you suffer from a severe lack of mobility. Other: For novelty value you might like to join a Segway tour around the main sights. The operator will give you a quick explanation of how to use the contraption before leading you around town in a small group. You’ll most likely be happy to spend a few hours on dry land during your visit to Cartagena but if you can cope with more time at sea there’s an interesting boat trip from the marina which goes across the bay to the lighthouse at Fuerte de Navidad (Fort Christmas) which you’ll have spotted as your cruise ship entered the port. The main tourist office is located inside the beautiful Palacio Consistorial in Plaza del Ayuntamiento. A simple city map is all you need to identify the main sights worth seeing during your day in port beginning with the museum to the city’s Roman Theatre which lies just a few metres away inside the salmon-coloured building. Cruise passengers can make their own group and hire a local guide for an informative walking tour of Cartagena. Museo del Teatro Romano (Plaza Ayuntamiento): Once you’ve paid a small admission fee into Cartagena’s Roman Theatre Museum it’s well worth watching the short educational video about the city’s most important archaeological site. You’ll then proceed through a number of rooms and subterranean corridors which lead to the Roman Theatre itself. 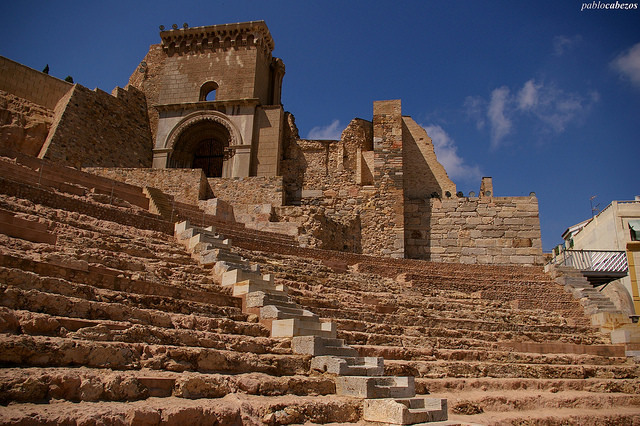 Built between the 5th and 1st centuries BC, this remarkable amphitheatre was only discovered in 1988 and is Spain’s 2nd largest after the one in Mérida (Extremadura). If you aren’t interested in going inside the museum you can still get good views of the Theatre from the street. Cartagena Cathedral: Located right next to the Roman Theatre are the remains of a church which dates back to the 13th century though it underwent various renovations over the centuries. It was only thanks to a construction project here in the late 1980s that the Roman site was ever discovered as the cathedral had been built on top of the theatre using materials from it. 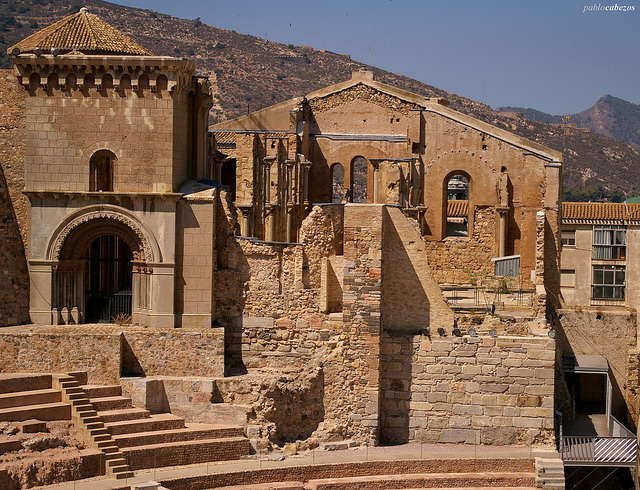 During the Spanish Civil War (1936-39) the site was left in ruins after bombing by Franco’s nationalist forces. It has never been rebuilt. El Castillo de la Concepción: To the north-east of Plaza del Ayuntamiento, within the grounds of Parque Torres, is Cerro de la Concepción which is one of the five hills surrounding Cartagena. The castle at the top was originally a Roman temple which was later fortified under Moorish then Christian rule. This is a great place for taking photographs of the city and your cruise ship in the port below. The walk up to the castle is hard work so it’s best to head for the lift (Ascensor Panorámico) on Calle Gisbert which takes you to the top. The adjoining Museo Castillo Concepción is worth a visit if you’re interested in learning more about the rich history of Cartagena. You can comfortably stroll back down the hill to the town or the port after visiting the castle. Civil War Museum (Calle Gisbert, 21): It was the bombing Guernica in the Basque Country in April 1937 which alerted the world to the atrocities of the Franco regime directed against civilian targets. Yet Guernica was not the only town which was bombarded by his German and Italian fascist allies. Cartagena was an important Republican stronghold during the Spanish Civil War which Franco saw as a threat because aid could be shipped to opposition forces through its port. In November 1936 the city was subjected to a horrendous aerial bombardment targeting the port, the city and the civilian population. This museum, housed within the civil war shelters located below the Castillo de la Concepción on Calle Gisbert, tells the story of what the ordinary people of Cartagena endured during this brutal ordeal. Museo Naval (Paseo Alfonso XII): The city’s naval museum is well worth a visit if you’re interested in learning more about the importance of Cartagena as a seaport from ancient to modern times. It is conveniently located at the end of the harbour as you’re walking into town from the cruise terminal. La Casa de Fortuna (Plaza de Risueño, 14): This is a particularly interesting attraction as it is the remains of an authentic Roman home from the the 1st century BC containing typical household items from that era. Museo Nacional de Arqueología Subacuática (Paseo Alfonso XII): The National Museum of Underwater Archaeology (ARQUA) provides a fascinating insight into how ships and the shipping industry have developed throughout history. Museo Arqueológico Municipal de Cartagena (Calle de Santiago Ramón y Cajal, 45): Located on the northern edge of the Old Town this important museum is built on the site of the city’s Roman Acropolis. Its exhibits represent a collection of artefacts accumulated over the ages from around the region. Getting There: The nearest airport to Cartagena is Murcia–San Javier Airport which lies approximately 30km to the north-east. A number of budget operators including easyJet and Ryanair offer flights there during the summer months. 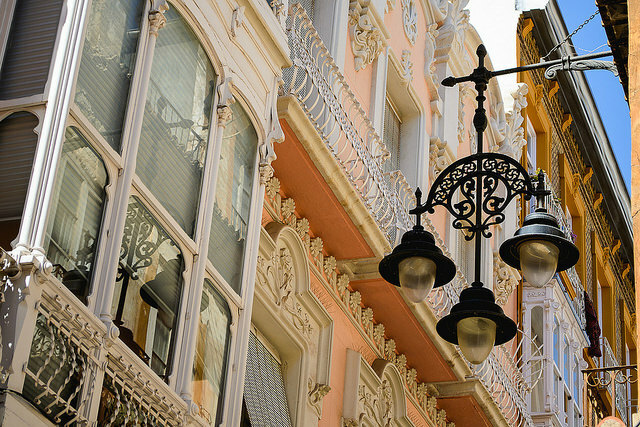 Accommodation: You’ll find the latest deals on Cartagena hotels at Booking.com.